The term "National Treasure" has been used in Japan to denote cultural properties since 1897. The definition and the criteria have changed since the inception of the term. These residential structures adhere to the current definition, and were designated National Treasures when the Law for the Protection of Cultural Properties was implemented on June 9, 1951. The items are selected by the Ministry of Education, Culture, Sports, Science and Technology based on their "especially high historical or artistic value". This list presents 14[nb 1] entries of residential structures from 15th-century feudal Muromachi period to the early modern 17th-century Edo period. The structures listed include teahouses, shoin, guest or reception halls and other rooms which are part of Japanese domestic architecture. While most of the structures are located in temples, one is a castle. In 2009, the early 20th century Akasaka Palace was designated as National Treasure in the category of "modern residences" (Meiji period and later). Because it is the only National Treasure in this category, it is listed together with the 14 pre-Meiji period structures. The foundations for the design of today's traditional Japanese residential houses with tatami floors were established in the late Muromachi period and refined during the ensuing Momoyama period.Shoin-zukuri, a new architectural style influenced by zen Buddhism, developed during that time from the shinden-zukuri of earlier Heian period palaces and the subsequent residential style favored by the warrior class during the Kamakura period. 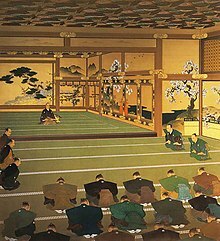 The term shoin (書院), meaning study or drawing room, has been used to denote reception rooms in residences of the military elite as well as study rooms at monasteries. A shoin has a core area surrounded by aisles, with smaller areas separated by fusuma sliding doors, or shōji partitions constructed of paper on a wooden frame or wooden equivalents, mairado (舞良戸) and sugido (杉戸). A main reception room is characterized by specific features: a recessed alcove (tokonoma); staggered shelves; built-in desks; and ornate sliding doors. Generally the reception room is covered with wall-to-wall tatami, has square beveled pillars, a coved and/or coffered ceiling, and wooden shutters protecting the area from rain (雨戸, amado). The entrance hall (genkan) emerged as an element of residential architecture during the Momoyama period. The oldest extant shoin style building is the Tōgu-dō at Ginkaku-ji from 1485. Other representative examples of early shoin style, also called shuden, include two guest halls at Mii-dera. In the early Edo period, shoin-zukuri reached its peak and spread beyond the residences of the military elite. The more formal shoin-style of this period is apparent in the characteristics of Ninomaru Palace at Nijō Castle as well as the shoin at Nishi Hongan-ji. The simpler style used in the architecture of tea houses for the tea ceremony developed in parallel with shoin-zukuri. In the 16th century Sen no Rikyū established dedicated "grass hut" (草庵, sōan) style teahouses characterized by their small size of typically two to eight mat, the use of natural materials, and rustic appearance. This teahouse style, exemplified by the Jō-an and Tai-an teahouses, was influenced by Japanese farmhouse style and the shoin style featuring tatami matted floors, recessed alcoves (tokonoma) and one or more ante chambers for preparations. By the beginning of the Edo period, the features of the shoin and the teahouse styles began to be blended. The result was an informal version of the shoin style, called sukiya-zukuri (数寄屋造). Sukiya-zukuri has the characteristic decorative alcove and shelf, and utilizes woods such as cedar, pine, hemlock, bamboo, and cypress, often with rough surfaces including the bark. Compared to shoin style, roof eaves in the sukiya style bend downward. While the shoin style was suitable for ceremonial architecture, it became too imposing for residential buildings. Consequently, the less formal sukiya style was used for the mansions of the aristocracy and samurai after the beginning of the Edo period. Examples of sukiya style architecture are found at the Katsura Imperial Villa and the Black Study Hall of Nishi Hongan-ji. In total there are 15[nb 1] structures at ten compounds in five cities. [nb 2] Ten of these structures are located in Kyoto. The compound with most National Treasures of the residential building category is Nishi Hongan-ji, with three structures. The table's columns (except for Remarks and Image) are sortable pressing the arrows symbols. The following gives an overview of what is included in the table and how the sorting works. Date: period and year of the construction; The column entries sort by year. If only a period is known, they sort by the start year of that period. Location: "town-name prefecture-name" and geo-coordinates of the structure; The column entries sort as "prefecture-name town-name". Image: picture of the structure; If the image shows more than one structure, the respective structure is indicated by a blue rectangle. ^ a b c d e f g h i j k l The National Treasure structures of Nijō Castle form a continuous structure (Ninomaru Palace) and are registered as a single National Treasure under one registration number. Only in the main treasure table of this article, the single entry is split in parts for readability. ^ a b c d e The Tokyo Akasaka Palace is the only structure in the category of "modern residences" (Meiji period and later). All other structures in this list are much older from the late 15th to early 17th century. ^ If a National Treasure was constructed during more than one period, only the oldest period is counted. ^ a b One munafuda (棟札) ridge tag with information on the building's construction is attached to the nomination. ^ An attached room and the connecting corridor between shiroshoin and kuroshoin are included in the nomination. ^ A board placed in the part of a room that can not be covered by a standard-size tatami. ^ (sangawarabuki, 桟瓦葺): a roof tile combining a broad concave tile with a semi-cylindrical convex tile into one tile. The tile is square undulating from concave to convex. ^ Coaldrake, William Howard (2002) . Architecture and authority in Japan. London, New York: Routledge. p. 248. ISBN 0-415-05754-X. Retrieved 2009-11-01. ^ "Cultural Properties for Future Generations" (PDF). Tokyo, Japan: Agency for Cultural Affairs, Cultural Properties Department. March 2017. Archived from the original (PDF) on 2017-12-16. Retrieved 2017-12-17. ^ a b c 国指定文化財 データベース. Database of National Cultural Properties (in Japanese). Agency for Cultural Affairs. 2008-11-01. Retrieved 2009-04-16. ^ 国宝・重要文化財（建造物）の指定について [Designation of National Treasure and Important Cultural Property structure] (PDF) (in Japanese). Tokyo: Agency for Cultural Affairs. 2009-10-16. Archived from the original (PDF) on 2010-10-08. ^ a b c d e "shoinzukuri". JAANUS – Japanese Architecture and Art Net User System. Retrieved 2009-11-17. ^ "shoin". JAANUS – Japanese Architecture and Art Net User System. Retrieved 2009-11-17. ^ "souan". JAANUS – Japanese Architecture and Art Net User System. Retrieved 2009-11-17. ^ a b c "sukiyazukuri". JAANUS – Japanese Architecture and Art Net User System. Retrieved 2009-11-17. ^ The Agency for Cultural Affairs (2008-11-01). 国指定文化財 データベース. Database of National Cultural Properties (in Japanese). Retrieved 2009-04-16. ^ 名鉄犬山ホテル　有 楽苑／如庵 [Meitetsu Inuyama Hotel Urakuen/Joan] (in Japanese). Meitetsu Inuyama Hotel. Retrieved 2009-11-14. ^ "irimoya-zukuri". JAANUS – Japanese Architecture and Art Net User System. Retrieved 2009-11-08. ^ 勧学院客殿 [Kangakuin Guest Hall] (in Japanese). Mii-dera. Retrieved 2009-11-08. ^ a b "karahafu". JAANUS – Japanese Architecture and Art Net User System. Retrieved 2009-11-08. ^ "kirizuma-zukuri". JAANUS – Japanese Architecture and Art Net User System. Retrieved 2009-11-08. ^ 光浄院客殿 [Kōjōin Guest Hall] (in Japanese). Mii-dera. Retrieved 2009-11-08. ^ 観智院客殿 [Kanchiin Guest Hall] (in Japanese). Tō-ji. Retrieved 2009-11-08. ^ a b Daigoji Sanboin. Daigo-ji. ^ a b "World Heritage Kyoto DAIGOJI Temple : Guide to Daigoji Complex　Guide to Sanboin" (in Japanese). Daigo-ji. Retrieved 2009-11-14. ^ "sangawarabuki". JAANUS – Japanese Architecture and Art Net User System. Retrieved 2009-11-14. ^ a b Ginkakuji Temple (in Japanese and English). Ginkaku-ji. ^ "The Silver Pavilion or Kannon Hall". Shōkoku-ji. Archived from the original on 2011-07-20. Retrieved 2009-11-14. ^ "hougyou-zukuri". JAANUS – Japanese Architecture and Art Net User System. Retrieved 2009-11-14. ^ "Hall of the Eastern Quest". Shōkoku-ji. Archived from the original on 2011-07-20. Retrieved 2009-11-14. ^ a b c d e f "元離宮二条城" [Nijō Castle]. Kyoto. Retrieved 2009-11-14. ^ a b c 本願寺（西本願寺） [Hongan-ji (Nishi Hongan-ji)] (in Japanese). Nishi Hongan-ji. Archived from the original on 2009-10-18. Retrieved 2009-11-14. ^ 黒書院 [Black study hall] (in Japanese). Nishi Hongan-ji. Archived from the original on 2009-10-20. Retrieved 2009-11-14. ^ "yosemune-zukuri". JAANUS – Japanese Architecture and Art Net User System. Retrieved 2009-11-08. ^ "ryousage-zukuri". JAANUS – Japanese Architecture and Art Net User System. Retrieved 2009-11-08. ^ 対面所 [Meeting room] (in Japanese). Nishi Hongan-ji. Archived from the original on 2009-06-25. Retrieved 2009-11-14. ^ 白書院 [White study room] (in Japanese). Nishi Hongan-ji. Archived from the original on 2009-08-17. Retrieved 2009-11-14. ^ "nure-en". JAANUS – Japanese Architecture and Art Net User System. Retrieved 2009-11-14. ^ "hongawarabuki". JAANUS – Japanese Architecture and Art Net User System. Retrieved 2009-11-09. ^ 飛雲閣 [Flying Cloud Pavilion] (in Japanese). Nishi Hongan-ji. Archived from the original on 2009-06-24. Retrieved 2009-11-14. ^ "hiunkaku". JAANUS – Japanese Architecture and Art Net User System. Retrieved 2009-11-09. ^ "Tai-an teahouse". artofjpn. Archived from the original on 2009-08-21. Retrieved 2009-11-08. ^ 待庵-光 の 空 間 [Tai-an, room of light] (in Japanese). vivi planning. Archived from the original on 2009-03-10. Retrieved 2009-11-08. ^ 待庵 [Tai-an] (in Japanese). goo. Retrieved 2009-11-08. ^ 龍光院書院 [Ryōkō-in Shoin] (in Japanese). Archived from the original on 2012-12-19. Retrieved 2009-11-14. ^ "State Guest Houses". Cabinet Office Government of Japan. Archived from the original on 2011-05-18. Retrieved 2009-12-01. Young, David; Young, Michiko (2007) . The art of Japanese architecture. Architecture and Interior Design (illustrated, revised ed.). Tuttle Publishing. ISBN 0-8048-3838-0. Retrieved 2009-11-11. Young, David; Young, Michiko Kimura; Yew, Tan Hong (2004). Introduction to Japanese architecture. Periplus Asian architecture (illustrated ed.). Tuttle Publishing. ISBN 0-7946-0100-6. Retrieved 2009-11-11. Nishi, Kazuo; Hozumi, Kazuo (1996) . What is Japanese architecture? (illustrated ed.). Kodansha International. ISBN 4-7700-1992-0. Retrieved 2009-11-11. Wikimedia Commons has media related to National Treasure residences.